Summary: It was thought to be impossible for man to kill the god-like Fhrey. When one Fhrey is killed by a lesser Rhune, potential war between the two races begins to brew. Meanwhile, a Rhune township named Dahl Rhen struggles with leadership upheaval, political maneuvering, and a menacing bear that threatens to rip their limbs and lives to shreds. Review: To be honest, this novel only caught my eye because of its wonderful cover image (see illustrator Marc Simonetti’s full version here). I have not read Michael J. Sullivan’s other Riyria novels, but this Riyria prequel and series starter seemed like a good place to begin. What’s admirable about this novel is that it tells a tight, self-contained story while also leaving enough loose threads to carry over into the subsequent sequels. Age of Myth feels like a quest in The Witcher video game series in the style of The Hobbit. Although dealing with the politics of racial inequality and the end of the world, the tale is lighter in tone than most other comparable fantasy series that trend towards the grimdark. Sullivan positions his characters on far reaching parts of the map before their interests, fates, and motivations become intertwined. While the characters are apart, the story feels disjointed and lacking direction, but once these characters are thrust together things begin to click into place. The characters that Sullivan has placed in this world feel a bit hollow and underdeveloped, with the exception being Suri, the mystic girl who seems able to speak to trees, spirits, and her trusty wolf Minna. Suri is a fascinating and peculiar character who lights up every page that she graces. Suri’s presence and Sullivan’s knack for humor are a saving grace for a novel that I was not totally taken with at the outset. 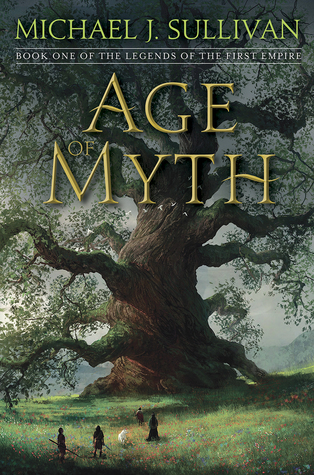 Buoyed by a strong third act filled with twists and monumental confrontations, the Age of Myth tells a satisfying tale that I would be interested in revisiting in the future–either in its sequel, Age of Swords, or Sullivan’s other Riyria novels.